this is my time of year. 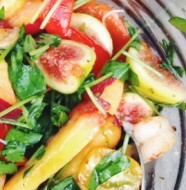 fresh fruit, veg, gardening, farmers markets. all things that excite me, get me going. bring out my creativeness. those beautiful delicious flowers that grow in your garden, come with your csa, find at the store. pop a few seeds in the ground in the spring and by the end of june, well, the flowers appear. and bam, dinner. well, my dinner. cause i can just stand in my kitchen and inhale these beauties all day and night long. on a serious note, like that will ever happen, picking, cleaning and serving these flowers can be a great science lesson. for your big guys though. trust me. cause when you try to explain to your 5 year old the difference between male and female flowers there is giggling. and then trying to explain pollination, forget it. but in all seriousness, it’s kind of fun. so as you can see the male flower has the long thin stem and the female produces the fruit. when you open the flower you can see the male sexual organ vs the female organ. the littles got a huge kick out of this, there was some prancing around after our lesson however where i then learned my children or 1 child in particular was not ready to hear this. i can only hope my almost kindergartener will not be repeating this at camp. but i will tell you this, they were excited. they went into the garden and showed me the male and female flowers, asked to pollinate them and then pick. it was great to see their little faces light up with excitement, get dirty, have fun and learn at the same time. after picking however there is cleaning and of course cooking. i like to take out the organs, but some don’t, and you don’t have to. i prefer not to eat them, it’s a little time consuming, but it’s my preference. last year, when i was testing recipes, i stuffed them with ricotta and then dunked them in a beer batter. excellent, but a lot of work. 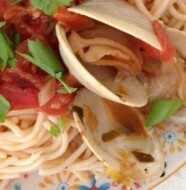 this year we tried 2 different recipes. the first one was from my foodie crush laura calder. awesome. but with gf flour it was a little much. you can see the batter is heavy. it got 5 stars from the kids though. the 2nd, lighter, crispier, and the winner here. 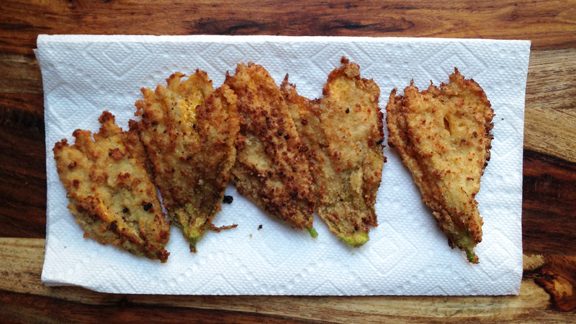 so what do you do with your zucchini flowers? have you picked any from your garden yet? clean your flowers. if from the garden, i like to soak in water. i have come across little caterpillars in the past as well as the occasional bee. if you are like me, take out the organs. whisk the egg and milk in a bowl. throw together all the dry in a big bowl or on a big plate. heat up oil and set up your paper towels for draining. dunk the flower in the wet, coat with the dry. 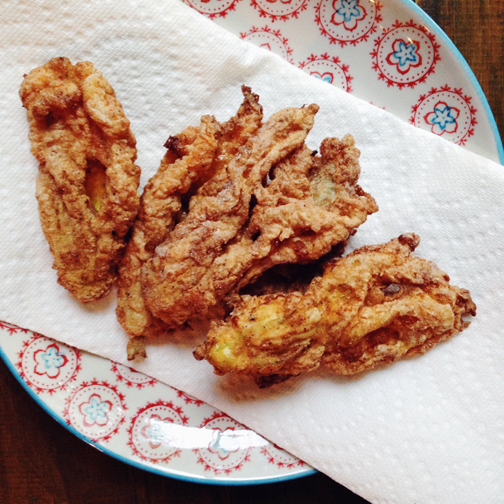 fry till golden brown and flip, repeat. drain on paper towels, and eat. 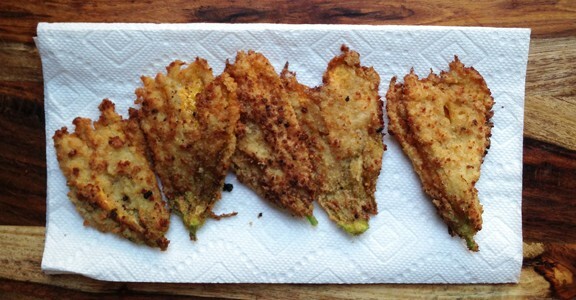 3 Comments on "panko crusted zucchini flowers"
Yes girl! Give me some of those. August is just around the corner. We’ve got to start making some plans! 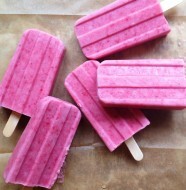 I made these last night and we loved them! 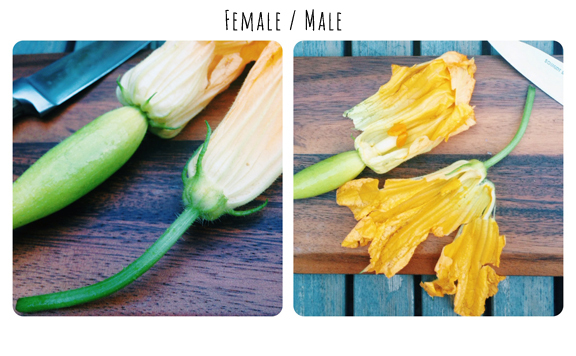 I had never eaten zucchini flowers before and had no idea what to do with them. Thanks! I made these tonight and they were delicious! Kids loved them too. The only changes I made were using regular panko since I am not gf and I mixed it with pecan meal since that’s what I had on hand. Thanks for the recipe- I had no idea what to do with these when I got them!